Automata custom codes allow you to create you own data dictionary entries, and associate them with one or more rentals. It's easy to create custom codes in Automata. Give the custom code a name. The custom code name must be alphanumeric, and must not contain any spaces. Select a rental. Each custom code can be assigned to one or more rental. 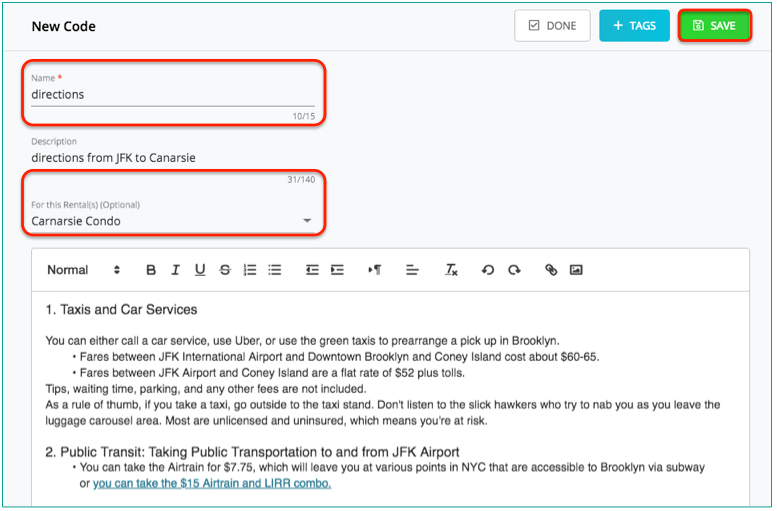 Tip: custom codes work great for populating a message template with your own info across multiple rentals. For example, you can create a custom codes for city attractions, and use that same custom code across all rentals in that city. Multiple codes can be made with the same name, but different rental assignments. The custom code assigned to a rental will be used for any messaging sent to that rental that contains the custom code. Type directly in the custom code editor. Click "Save" to save or update the custom code. Once your custom code is created, it can be used in Automata Templates. These will appear under the "Custom" tab in the Automata Data Dictionary.